By some miracle, I woke up bright and early this morning, even before the alarm. This gave me time to pack and do some preparation that I might not otherwise get around to doing. As of now, I have really ceded possession of my dorm room. If I felt like my room had lost some of its personal touch when I packed up my rug and some other minor things, the effect is completed. I have packed up all non-essential things except my hoop and bookshelf, which I'll need larger boxes for; all my posters and random personal objects have been taken down and packed. The only thing that appears relatively intact is my desk, though I have emptied out the drawers. It's sort of funny... I can make do using plasic bags without a trash can, but it would be a horrible tragedy to go without my computer for a few days. In any case, it's sad to see 'my' room become completely barren. 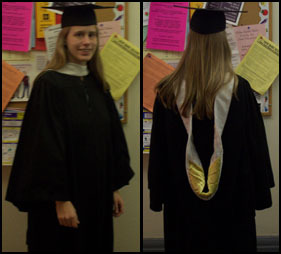 This morning, I also went to get my cap and gown in the Campus Center. Of couse, the nice zip-up gowns were only bought in the large sizes (it's shortism, I tell you), but I was able to get a decent gown of the right length. After placing the academic regalia in my room and moving my boxes outside, I went to the library and checked out the movie Pollock. I later went to the Starbucks to read more of A Beautiful Mind before returning to the dorm. It's hard to believe that it's only a matter of days before I take my leave of this place. Thus far, my life has been ruled by some amount of certainty; ever since preschool, I've been a student, and I've had the same sort of life, even though I have moved 'up' from preschool through elementary school, junior high, high school, and now college. Even if I do end up pursuing graduate school, my life will be very different, since I will have to choose a particular path, and decision-making has never been my forte. I like to daydream, and figure out a thousand incredible (and often ridiculous) futures, but to commit to any one future would mean that I'd have to let the other 999 wither and die. Of course, it's not healthy to live in a dream world like that, but it's hard to be honest with myself about my prospects for the future.